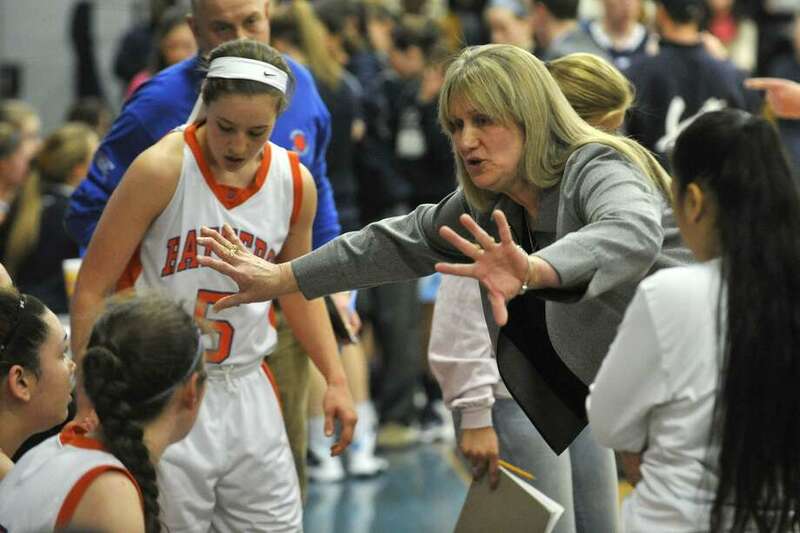 If the Danbury girls basketball team qualified for the state tournament, it is noted. If one of her girls made All-State, it’s there. And when the numbers are added, they will show DiNardo on the cusp of becoming the second female Connecticut coach to win 500 girls basketball games. It could come Wednesday at home against Stamford (the game was postponed from Tuesday, due to weather). No. 499 arrived in the most dramatic fashion Friday. Susana Almeida hit a 3-pointer with 3.8 seconds left to lift the Hatters over Fairfield Warde in their annual Coaches vs. Cancer game to honor DiNardo’s late husband. On Wednesday night, DiNardo will look up at the American flag that hangs on the wall of the Danbury gym. Editor’s note: Due to weather concerns, Danbury’s game vs. Stamford has been postponed until Wednesday, 7 p.m. at Danbury HS. The story has been updated to reflect this.